As we age, the skin's natural processes of renewal begin to slow and skin loses elasticity. Regenerating Eye Cream helps supports the skin's natural renewal process, smoothing and refining the delicate skin around the eyes. Skin is revitalized and hydrated, and the appearance of fine lines and wrinkles is minimized. Formulation: Antioxidant-rich acerola berries and sea buckthorn join red clover to enhance skin tone and elasticity. Birch leaf, quince seed and borage refine pores and balance moisture. Shea butter and botanical oils replenish, soften and protect. I've been using the product for a few months now and have yet to see any changes in my under eye area. I just started using this product two months ago and already ordered my 2nd one during the 12 days of Christmas sale. I see a difference in my skin around my eyes. I will use it day and night even though the recommendation is to only use it during the day and nothing but the toner and night serum at night. I have noticed an improvement of the bags under my eyes since using this product. Thank you. I am new to the Hauschka skin care line, only three months. I am very happy with the Regenerating Eye cream. I see improvement in my dry skin condition and redness. It is a great help to these 80 years old eyes ??. I recommend giving it a try. This the first time I have utilized the cream and I usually have issues with eye cream products but I loved the cream .. no issues so far! I have very reactive skin and this has been a wonderful product to add to my skin routine. It is light yet feels very soothing. I have been using consistently for 3 weeks and noticing reduced puffiness and less prominent crow’s feet. I will be purchasing again. 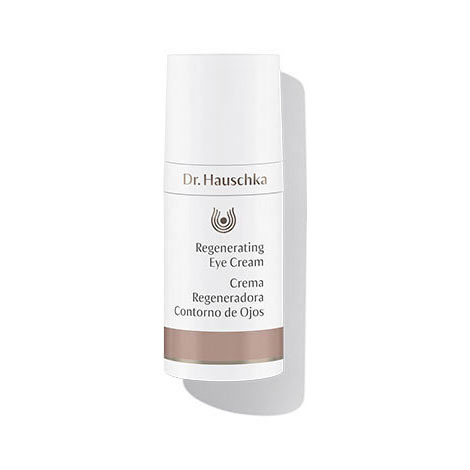 I started using the entire regenerating line from Dr. Hauschka about 8 weeks ago and will never use anything else. I have noticed such a drastic difference in my complexion during this time that I am just astounded. The eye cream has visibly reduced deep wrinkles around my eyes. Everyone has been asking me what I am doing to look so great! This is by far the best eye cream I have ever used. It is clean feeling, refreshing, and it works! Combined with the other Dr. Hauschka products I use, my skin has never looked or felt better. I am a most loyal customer for life! Bought this for my mom and she loves it! If not the best, it is one of the best eye creams I have ever tried. After 2 months of using this eye cream I noticed a significant improvement in my crows feet. I love the luxurious feel of the cream. It is very moisturizing without being greasy. Lovely, pure scent. I received a sample and was surprised how soothing this felt to eye area. I have allergies that affect my eyes and I am always rubbing them dry. I will be buying some soon. I’ve been using this eye cream for a few months and have noticed a smoother tone to my previous crows feet. It’s not greasy and I can put eye makeup on without runny mascara or separating eye shadow. This is a nice eye cream, moisturizes and minimizes fine lines. I have had difficulty finding an eye cream that keeps my eye area moisturized all day and this one does! A little goes a long way. It doesn't travel and get into my eyes to sting either. Very happy with it and the skin around my eyes is looking brighter than ever. Love the regenerating eye cream. A little goes a long way. Absorbs quickly. Definitely see an improvement in my laugh lines. I’m new to Dr H products, and my skin was in need of something new and safe. The eye cream gave me a smoother, brighter under eye area almost immediately. It has softened the lines. Like it quenched a thirst. I love it. Only been using a couple of weeks, only reason for 4 stars, I don’t like to just throw 5 stars around easily. But I will continue to use. A little goes along way. This will last awhile which is great!! I use it morning and night and I can feel the difference, it makes the skin more tight and refreshed, if I go outside I also put the eye balm on top for more protection, worth every penny !! The winter has been drying and for the first-time, my eyes looked stressed. My eyes are sensitive... Most creams leave me itchy later. This one is rich, stays put and keeps the area moist. The eye cream takes away the tiredness and soothes around my eyes. My eyelids were starting to droop as happens as we age. I started using the Regenerating eye cream and noticed a significant lifting and brightening. Even my friends noticed “something looked different”! I have used the Regenerating Eye Cream for several years. There are very few eye creams that I can use because I have sensitive skin. It is wonderful. I've used other eye creams before, they seemed to just impose their effect on the skin around the eyes, causing only temporary improvement. I received some samples of this product and even without everyday use there's noticeable improvement on the smoothness of the skin around the eyes It seems like it's working WITH the skin to reduce fine lines. So glad I could try this product as I normally would not have sought to purchase it. An eye cream that seems to actually work! This cream absorbs very well not leaving greasy feeling. I've noticed my fine lines disappearing after a couple weeks use! My skin also does not appear to look as dark as it did! I love this cream! I have been a fan of Daily Mosturizing Eye Cream for years until I received a sample of the Regenerating Eye Cream. After the first application, I was thrilled! It is a little heavier, so soothing, and supportive of the delicate eye area. Perhaps aging is not so bad, after all!! After two weeks I LOVE IT ! The smell is really clean and pleasant! I've used it only for about two weeks and have noticed a smoother softer feeling complexion. It absorbs really nicely ~ not greasy at all. Though a small bottle, a little does go a LONG way! I am looking to get the cleanser next! Finally a great eye product!! I just tried using this eye cream recently, and already notice positive results. Be sure not to push pump too hard, as cream dispenses quickly and you only need a very small amount. This product has light texture, lasts long time and really works. Lovely smell as well. This is the best eye creme I have ever tried (and I have tried many natural ones, by different brands), hands down. I have sensitive skin, especially under my eyes. The skin under my eyes has started showing minor signs of aging quite early. This moisturizer makes all the difference in the world. It is light, absorbs easily and quickly, makes the skin under my eyes visibly smoother and plumper. I use mascara and eye-liner, and it works great under make-up. It is highly unlikely that I would ever switch to another product. This eye cream is moist but not oily. It works well to minimize fine lines and wrinkles but does not cover dark circle. I have only been using this cream for a week or so but believe there is the beginning of a visual difference, so look forward to continuing its use and the other Regenerating products! Regenerating Eye Cream is very light at the same time nourishing and protective on the delicate skin around the eye. I love it. Drifted away from Dr. Hauschka. Mistake. My skin is improving since I came back-- most especially with the eye cream. Today I re-applied on top of concealer in the middle of the day & my eyes were brightened. Love these products! Works as advertised but does not help puffiness or dark circles. I have to use a second product. Exceeds expectations - can't wait to see what's next! After 15 years of using my (old) favorite brand, the bee company stopped making my eye cream. I was devastated; how could I replace that eye cream. Then I found Dr. H's Regenerating Eye Cream and was blown away. Not only does it reduce those purple/blue tones from under my eyes, it's amazing with fine lines and the elasticity of my skin. After 2 weeks I'm a believer. I really can't wait to see how my delicate eye area looks after 2 months. Thanks, Dr. H; I'm a customer for life!! This is the greatest eye area cream for softness and easing lines. The cream is non greasy and doesn't run into your eyes or onto your glasses. It has a great subtle aroma, like all Dr. Hauschka products. The lines around my eyes, are not as "deep" and pronounced just THREE DAYS after using this product. I'm an artist, so I cannot help but observe tiny, significant details like this! Plus I love how this stuff smells! Dr. Hauschka, I'm a fan for life! I've been using the cream for a little over a week. Already, the skin around my eyes appears revitalized and feels more hydrated. I love the way it smells! I don't know if its psycological, or real. I dont think it really matters either. What matters is that this eye cream makes me think that the skin around my eyes looks better. I recommend it. My sister uses it as well as my best friend. Our ages are 38, 48 and 54. Not moisturizing enough. It makes wrinkles even more noticeable. Use mornings only, after cleansing with Cleansing Cream and toning with Regenerating Serum. Using fingertip, gently press a small amount (about the size of a grain of rice) onto the area around the eyes working from the inner corner outward. Avoid pulling or dragging the skin. Follow with Regenerating Day Cream. Regenerating Eye Cream is fast-absorbing—ideal for use before applying eye make-up. Daily care with Regenerating Serum, Regenerating Day Cream, Regenerating Neck and Décolleté Cream and Regenerating Body Cream.